CAN WE GET THREE CHEERS FOR UPPERCASE BOX. Oh my goodness, this box has stepped up their game between last month and this month and I am in love. This month was absolutely stunning and I’m so excited to share it with you all! So the book – I simply HAVE to talk about the book included because this has been on my to-buy list for ages, but I’ve recently decided I have to wait at least a month for New Releases to calm down before grabbing them (just to avoid getting duplicates in my subscription boxes). 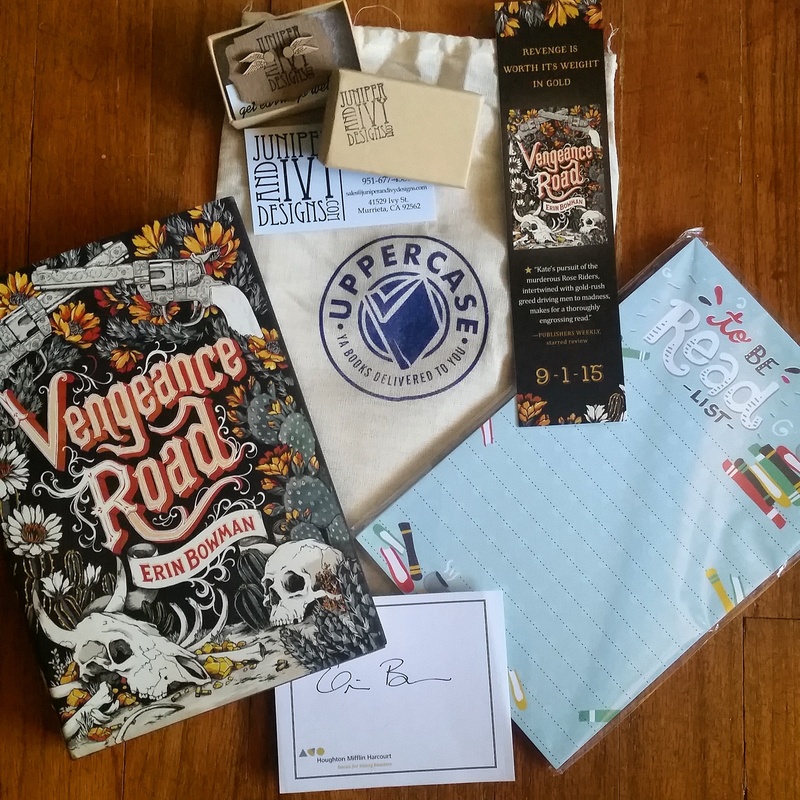 I was absolutely GIDDY to find Vengeance Road by Erin Bowman as this month’s book, nevertheless a signed bookplate (which I’ve come to expect, but you know, still exciting), and a custom Vengeance Road bookmark as well. Also included were a pair of beautiful wood engraved Golden Snitch earrings by Juniper & Ivy Designs which were absolutely gorgeous. I was so taken aback by the amount of detail in them. I absolutely love those and how personal they feel. Finally, I am one of those people who can never have too many notepads, and this Uppercase Box original TBR notepad by Risa Rodil is so cute and I have it hanging on the side of my bookcase! I definitely adore this – great addition to the box. Uppercase has honestly stepped up their game between last month and this month and I’m so excited for this to continue into the coming months as well. If you’re looking to get your hands on a future Uppercase Box (which I highly recommend you do) – head over to their website and grab one!